In June 2010, Justin Childers posted about his prayer bench. I remember reading his post and realizing that having a specific place would be great for me. I want to pray more. I want to be a follower of Christ who knows that apart from Christ I am nothing. I want this to be displayed in my prayer life, thus displaying my reliance upon Him. I also want to be a pastor who leads by following Christ. Again, through Scripture reading and prayer I want this to be evident. With that being said, I recently read Justin's post again and printed it out to give to a member of mine. I knew he was able to do good work with things like this, but wasn't sure how it would go. Today, around 3:00 PM, he called me to ask if he could come by the office for a minute. I was about to head out, but he stated it would only take a minute or two so I said okay. 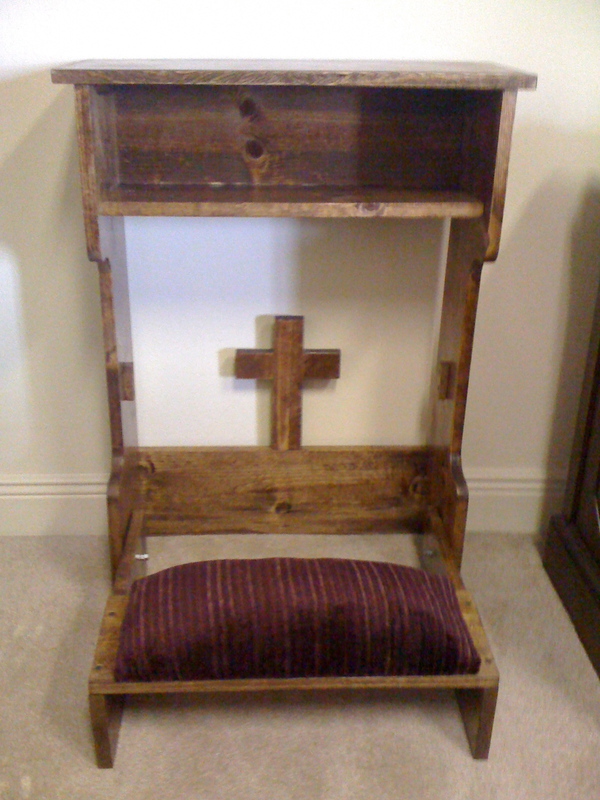 When he arrived, he surprised me with this prayer bench. I was amazed that he took the pictures and the dimensions, and built me a place where I can pray. You may not need a bench like this, but I hope you have a place or at least a plan to pray. We are completely dependent upon Him whether we realize it or not. I look forward to using this to pursue Christ and to plead with Him because apart from Him I am nothing. I am glad that you have a wonderful church member to built you one.